Search engine optimization (SEO) is the process of improving the visibility of a website or a web page in search engines search results. In general, higher ranked the more frequently a site appears in the search results list, the more visitors it will receive from the search engine’s users. SEO may target different kinds of search, including image search, local search, video search, or news search. There a reasons why unique content plays an important factor in your site. Content is your opportunity to differentiate yourself from your competitors and it keeps visitors interested at the same time, adding your keyword. We will create original, unique and SEO-optimized content based on your custom content strategy to help drive your customers and prospects to your web site. 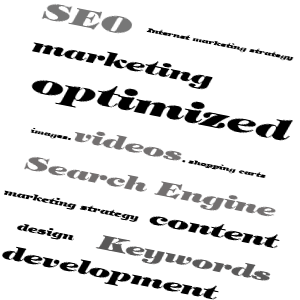 As an Internet marketing strategy, SEO considers how search engines work, what people search for, the actual search terms or keywords typed into search engines and which search engines are preferred by their targeted audience. Optimizing a website design and structure may involve editing its content and HTML and associated coding to both increase its relevance to specific keywords and to remove barriers to the indexing activities of search engines. Promoting a site to increase the number of backlinks, or inbound links, is another SEO tactic.